The Renaissance Troll: The Hounds of Doom are Free! I have nearly finished up all of the figures needed for Rangers of Shadow Deep: Blood Moon. Here’s a big bunch of baddies, I recently completed. I admit, I didn’t spend a great deal of time on any of them – after all, my rangers are hoping that none of them remain on the table too long! The werewolves are Dracula’s America figures. 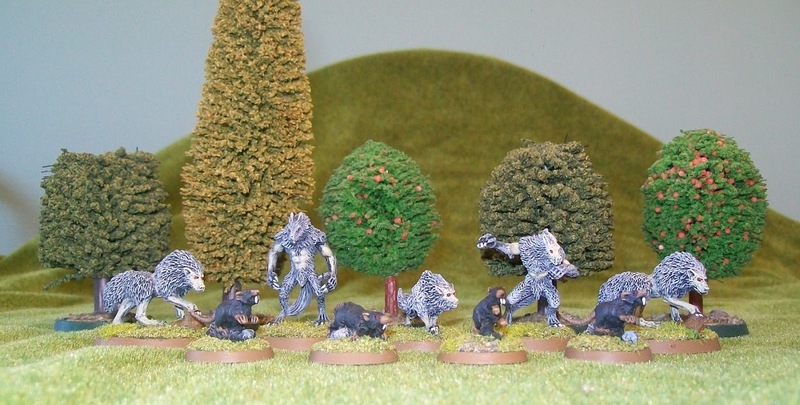 The wolves, including the little wolf, and the giant rats are all from the Frostgrave range. I could probably use another wolf or two, but I’ll wait until I’m at a show to pick some up. Other than that, the only figures I still need are the two children that may appear. If anyone has a lead on good children models that scale to Frostgrave or true 28mm please drop it in the comments. I did most of the painting of these guys while listening to Hood on BBC Radio 4 Extra. It’s a very unusual retelling of the Robin Hood story. Same basic setting and idea, but not all of the classic figures are playing the role you expect. All four episodes are now available to listen to online, for those in the BBC area, although the first one is only up for another week. I have listened to the first three, so I can’t comment on the ending, but it’s been really enjoyable so far! * The title of this blog comes from a poem by Robert E. Howard. Great stuff. Those Werewolves are awesome. I use the Black Tree Design children. Great recommendation, gonna check HOOD out when I get a chance. Base size doesn't really matter. Thanks for the suggestion. Thanks :-) I have no excuse not to get painting now. Hasslefree have some good "medieval " children sets under their Fantasy Human range. They are more true 28 than heroic so should scale well with Frostgrave stuff. If anything, their normal humans are a bit more slender I think. Doh, didn't see the previous comment. I am talking to someone about the possibility, but nothing definite yet. Thanks for your answer Joe. I will not wait, I will buy the english version. Hi Joseph, it is I, the Old Gamer! Just a quick note, my son a few friends and I are going to Shadow Deep on the 3rd of Feb. We all have our Rangers ready and are working on the assorted villains/creatures. Any time I can game with my son is a good time! A quick and very effective paintjob. Dark Fable Minis has a pack of 4 Egyptian children.